You are currently browsing the Bringing Jerry Zimmer Home blog archives for December, 2012. 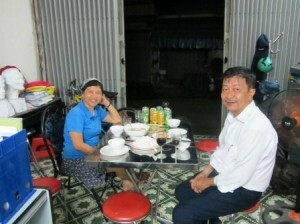 Hoa and Son are a great husband/wife team and have achieved the dream in post-war Vietnam. If it were not for one woman’s efforts five years ago, going door-to-door in the village of Son Vien, trying to find someone who remembered seeing my first husband, Capt Jerry Zimmer, USMC, crashing into the Que Son Mountains, along with his Radar Intercept Officer, 1st Lt Al Graff, we probably wouldn’t have been able to pinpoint their site. Nor would the Joint POW-MIA Accounting Command (JPAC) have had a compelling reason to continue searching for their remains. Thanks to the persistence of Nguyen Thi Anh Hoa, 55, a highly successful translator/guide for more than 20 years, we not only found the crash site, but Hoa and I became friends in the process. I initially met Hoa through Doug Reese, an Army veteran who settled in Vietnam for several years, before his recent return to the United States with a Vietnamese wife and baby. Hoa always rearranges her schedule whenever I am in country, and did so for my May/June 2012 visit, which was the best yet. 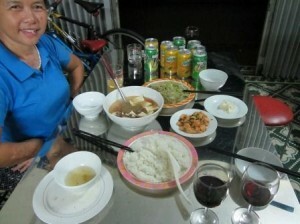 Besides visiting Jerry’s crash site, I also received a special invitation to Hoa’s home in downtown Da Nang to meet her family and have dinner with them. I was honored. We had a feast, and it was delicious. After spending a long, hot day in the Central Highlands with some of the people I have come to know in the rural village of Son Vien, Hoa and I headed for Da Nang, and I couldn’t wait to meet everyone. Arriving at her home, located in the center of the city, we were greeted by Hoa’s grandchildren –Sarah, 9, and Pat, 7, — both being raised by Hoa and her husband, Son, to help their son, a single-parent and a professor of architecture at a university in Da Nang. 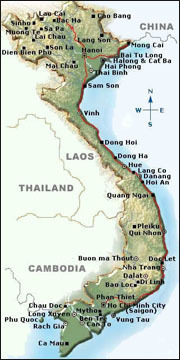 They also have another son, a lawyer practicing in Hanoi, where Hoa was raised before migrating south to Da Nang. At 7, Pat is a big kid and a nice one, too! The children were thrilled to have company for dinner and had fun speaking to me in English. Both were attending the English school in Da Nang, and it was apparent that they were happy, smart and healthy kids, thanks to a grandmother who was very conscientious about education and health. Among Hoa’s other achievements is a medical degree, earned in the Soviet Union years ago, but she ended up in the tourism industry and doesn’t seem to have regretted her decision. 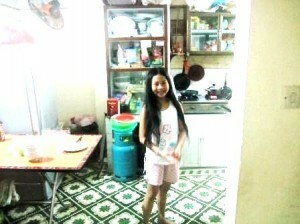 Sarah, 9, is beautiful and working hard at learning to speak English. Like many urban areas, Hoa’s home is located in a snug setting on a side street in Da Nang’s bustling environment. The interior is very practical and allows her to conduct business from home — she now owns a global tour service, complete with two Greyhound-style busses. We entered the house initially through an accordion-style metal door, which permits many of her neighbors with the same setup to open their doors in the morning, setup stalls and sell their fresh fish, vegetables and other necessities with ease. The large doors also provide easy access for the kids to play in the streets of their very tight-knit neighborhood. I was impressed with the functionality of their lifestyle. The food smelled amazing and included my favorite pho (soup) and beef, dumplings with a rich Vietnamese dipping sauce and a hearty bowl of rice. I am a long-time admirer of Vietnamese food, and this was excellent. 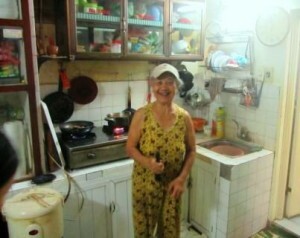 Hoa did some of the cooking, as did her live-in helper, Ba – a woman in her mid 70s, whose husband was suspected of being a double agent during the Vietnam War and apparently brutally killed by the Army of the Republic of Vietnam (ARVN). “He wanted to do it for the country,” she said. Five days after his death, the ARVN dropped his body off in front of their house, according to Ba, and his hands had been cut off, as had other parts of his body. A widow since the ARVN killed her husband for being a double agent, Ba has had a difficult life but now content living with Hoa’s family. At 28, Ba was left alone to raise her two small sons, in addition to spending a year in prison after her husband’s death. “I cried all the time,” she told me, and said that throughout her incarceration, they washed her mouth out regularly with shampoo, taped her eyes shut and gave her terrible food. She lived this way in a small room with one window until her release. And although not involved with her husband’s crime, Ba said she was punished because of what he did. When she returned home, the villagers all took care of her and five other women in the same predicament. Then one day the American military passed through her village of Dien Thang, and apparently one of the guys offered to buy her children and take them back to the United States, since she was so poor. Ba looked down while Hoa translated, telling me she often wished that her sons had gone with the soldier. “Ba has had a very difficult life,” says Hoa, explaining that she was now very happy living with Hoa’s family. “She does not want to leave,” says Hoa with a big smile. When we sat down to eat, Son brought out a bottle of red wine to accompany our meal. 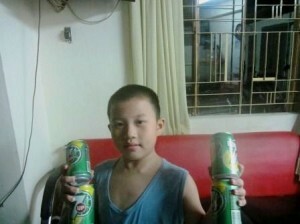 He and I drank a glass, while Hoa and Ba drank soft drink. I liked Son and thought that he and Hoa made a great team. There was no doubt that the family was happy and living a dream, which 40 years ago would have been just that – a dream and nothing more. Soon after dinner, Hoa flagged down a taxi for me, and I said good-by to my friends but hopefully not forever. *Many MIA families and veterans are not aware of the contributions made by locals in the villages and elsewhere throughout Vietnam, Laos and Cambodia. Over the years, JPAC has been able to locate and ultimately identify many MIAs with help from locals who know where our loved ones’ remains were buried long ago, or where a crash occurred and are willing to lead officials to that location. 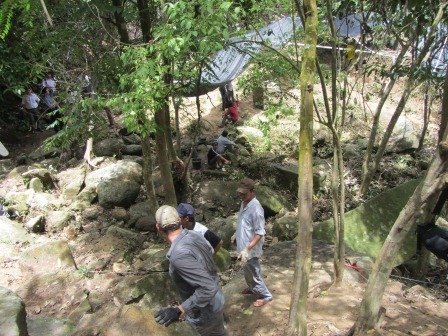 JPAC and Vietnamese Recovery Teams are deep within Vietnam’s Que Sons, May 2012, excavating Jerry’s and Al’s crash site. Being adept at rock climbing is almost a necessity at many of the remaining jet crash sites from the Vietnam War, especially in Laos. Until recently I have been more opposed than supportive of the Congressional mandate in the 2010 National Defense Authorization Act (NDAA) dealing with missing persons from past wars. However, I always try to keep an open mind and must admit that this piece of legislation may end up being a gift in terms of keeping the Joint POW/MIA Accounting Command (JPAC) moving forward on global recovery efforts of our MIAs in these uncertain times. Yet, understanding the nature of the accounting mission is imperative as the House Armed Services Committee and others examine the overall structure, leadership, redundancy and anything else within the accounting community that might affect the mandate’s success. Tackling the big issues is important, but decision makers should tread carefully, because even the best intentions can turn into a nightmare when looking for ways to “work smarter” – translation: do more with less – when juggling dollars and trying to make sense of gigantic cuts in the DoDs FY2013 budget. Families with MIAs still unaccounted-for hope that officials will communicate with knowledgeable sources inside the accounting command and within the National POW/MIA League of Families, especially League Chair Ann Mills-Griffiths who might not tell them what they want to hear, but rather what will work and what won’t. This methodology will help get the job done and undoubtedly save money. I have been a long-time advocate of JPAC, which reports to the US Pacific Command (USPACOM) and both are located in Honolulu. JPAC oversees investigations, recoveries and identifications of all MIAs from past wars. My support of the organization was earned after a long period of researching, writing and accompanying JPAC active duty military and civil service members (often retired military) on a couple of field operations – including a visit to Jerry’s and Al’s site — and attending regional and annual family league meetings. Whether or not you like a particular person or think there is a better way to do something, JPAC is committed to bringing home our MIAs, and I am increasingly in awe of their accomplishments. Everyone in JPAC spends time in the trenches, and they deserve our support.